In 2007, Maryland joined RGGI, a cooperative agreement among ten Northeastern and Mid-Atlantic states designed to reduce emissions of carbon dioxide (CO2) from major power generators through a cap and trade program. The state commissioned CIER to study the economic and environmental impacts of this initiative. The studyinformed the state’s decision to join. With the first auction for RGGI allowances (permits) held in September 2008, and the start of the first market-based program to reduce greenhouse gas emissions in the United States, Maryland will soon begin receiving RGGI auction proceeds. There are many decisions facing the State of Maryland about how to implement a program that will simultaneously achieve the goals of RGGI and those of the State. 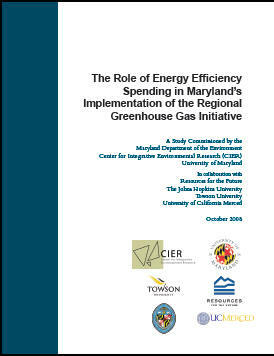 The Maryland Department of the Environment commissioned CIER to conduct another study to help the state explore economic and environmental implications of using RGGI revenue in support of energy efficiency programs, as well as to determine the impact on producers, consumers and other stakeholders. Any public expenditures in Maryland (and the other RGGI states) on efficiency in end-use electricity consumption will directly affect electricity markets and consumers. These effects and the strategies for successful implementation of such programs are the subjects of this report. This study builds upon the three models used in CIER’s first RGGI study. The research team compared the impact of investing half versus all auction revenues in efficiency improvements against a low investment baseline of one-quarter. Decisions regarding program design, regardless of the funding level for such programs, can have implications that affect the ability to achieve environmental, economic, fiscal and social policy goals. Insights from other programs and states - their levels of funding, program structures and administration – can help reveal opportunities for achieving policy goals. The study considers statewide energy efficiency programs in New York, Vermont and Maine.